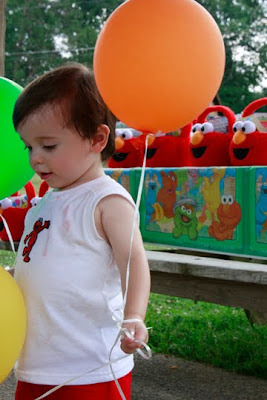 As promised in my Elmo Party post, I am excited to be giving away a Balloon Time helium tank party set! I have seen these tanks in the store many times, but never really thought about buying one. But, after using it, I can definitely say I am a fan! Basically, with a Balloon Time tank you receive the tank (which will blow up about 50 balloons), a package of 50 balloons and plenty of ribbon. 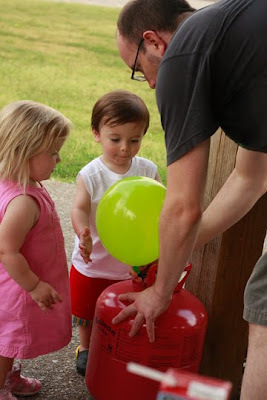 We took the tank to Elias’s birthday party and the balloons were a huge hit. Every kid received a balloon when they arrived to the party and then after cake, many of the kids just wanted to play with balloons. A few of them let the balloons go, which led to discussions of balloons in the sky with airplanes. The tank is also very cost effective. When I got the three balloons blown up with helium at the grocery store for Elias’s birthday, it was $3.75. The tank is $30-35 and it will blow up at least 50 balloons – that is definitely a cost savings, if you want to blow up that many balloons! 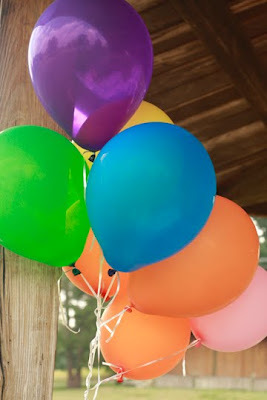 I am excited to give away one Balloon Time kit today! Just leave a comment with how you would use the tank.